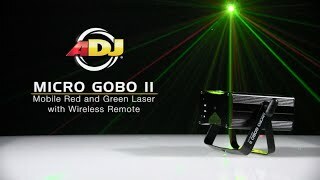 Considering purchasing the American DJ Micro Gobo II Laser? Have questions? Ask people who've recently bought one. Do you own the American DJ Micro Gobo II Laser? Why not write a review based on your experience with it. Bit disappointed it is so small. OK for small venues. Will have to look at something bigger in the future. Took this out to a few small scale gigs and was absolutely perfect with several members of the public commenting how good the effect looked. Used it at home during the festive season due to having a high ceiling too. Not had the chance to try it at larger scale gigs but feel judging on the small ones it may be able to do the job. Highly recommended especially for those on a lower budget. Small but powerful enough for a medium venue. Plenty of programming options, good effect with little effort. Worth a try. I have used a different manufacturers laser before in a mobile DJ setting for a couple of years without the Gobo...this was a straight swop and the gobo patterns make a huge difference. The projection field is much wider than my last one, the pattern changes are smooth and seem to stay in focus over the full ceiling space (last used in a 25 metre room) even when used at a fairly oblique projection angle. DJKit kept me fully informed of the delivery date (& time). For the price its a great bolt on to an existing lightshow and looks particularly effective with a little stage smoke. Seems great value for money. Very pleased with purchase. A great addition to my lighting set up. Smaller than I imagined but more than up to the job. Great price and great spec. £55 for a lazer, whats not to like. Great choice of effects and looks great with a smoke machine. boxed in good condition and they patterns it projects onto walls e.t.c. are amazing for the price. Another FAB product from American DJ and my friends DJKit which i will be buying from in the future. Seen a video for American DJ Micro Gobo II Laser online or have you own video? 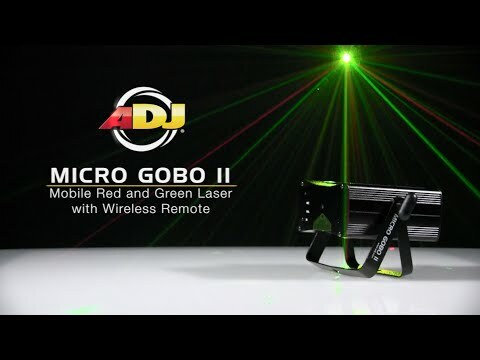 Check out American DJ Micro Gobo II Laser on DJkit.com!